How do I buy a College Hunks Hauling Junk Franchise? Are you interested in owning your own franchise? When you own a College Hunks franchise, you aren't just running a business. You're leading a team full of vibrant, clean-cut team members, or as we call them, HUNKS. Whether you're a recently retired military veteran and want a new kind of adventure, you're seeking refuge from the traditional corporate work environment, or you're simply ready to build a successful and profitable business of your own, the College Hunks Hauling Junk and College Hunks Moving franchise opportunities offer you the chance to achieve your dreams. COLLEGE HUNKS HAULING JUNK and COLLEGE HUNKS MOVING has raised the bar in the service industry. Our residential and commercial clients choose us because they trust our employees and love our brand.The COLLEGE HUNKS HAULING JUNK and COLLEGE HUNKS MOVING helps franchise owners grow profits with its systemized franchise business model that is easy to learn. Open College Hunks Hauling Junk in any of these available states: AK, AL, AR, AZ, CA, CO, CT, DC, DE, FL, GA, IA, ID, IL, IN, KS, KY, LA, MA, MD, ME, MI, MN, MO, MS, MT, NC, ND, NE, NH, NJ, NM, NV, NY, OH, OK, OR, PA, RI, SC, SD, TN, TX, UT, VA, VT, WA, WI, WV, WY. College Hunks Hauling Junk is the fastest-growing junk-hauling franchise and moving franchise in America. The company was started in 2003 by Omar Soliman and Nick Friedman, and it began franchising in 2006. Omar and Nick have been named two of the top young entrepreneurs in America by “Inc.” magazine. They literally wrote the best-selling book on entrepreneurship, co-authoring “Effortless Entrepreneur” to share the lessons, planning and strategies that have made College Hunks Hauling Junk an overwhelming success. 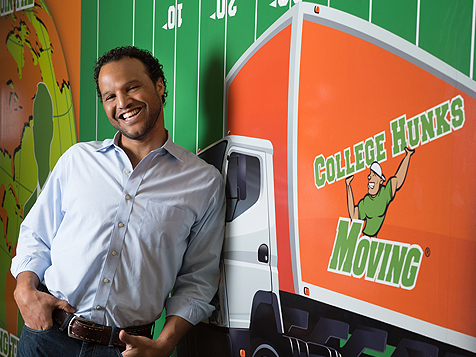 College Hunks Hauling Junk has been named one the fastest growing companies in America by “Inc.” and has made “Entrepreneur” magazine’s list of top franchise opportunities for five years in a row and counting. The growth is driven by a smart business model that allows College Hunks owners to act as executives in their businesses. They build the business in their community and provide leadership for their teams, but they are not in the truck hauling junk or moving couches. They’re building the business — and College Hunks gives them the tools they need to do it! College Hunks Hauling Junk also has impressive brand recognition. The franchise has been featured on The Oprah Winfrey Show, ABC’s Shark Tank, HGTV’s House Hunters, AMC’s The Pitch, Bravo’s The Millionaire Matchmaker, TLC’s Hoarding: Buried Alive andFox Business, as well as in The Wall Street Journal, The New York Times, USA Today, Time magazine, The Huffington Post, Forbes, Inc. and more. 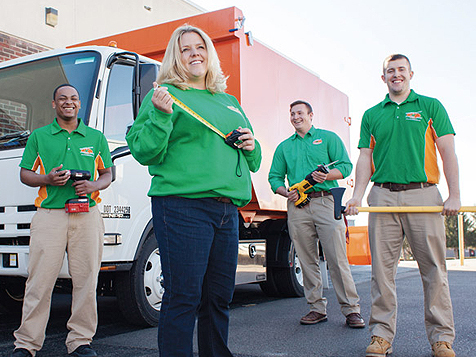 College Hunks Hauling Junk has been in demand — from franchisees, customers and the media — because our business is fun and rewarding, and our systems create a great experience for our customers and our franchise partners. Chief among those systems is our national call center, which books and schedules jobs for our franchisees seven days a week — a service that saves franchisees money and time. The call center also makes the business easier to manage. That’s important, because there is tremendous demand. College Hunks has built its reputation by having collegial employees who are dedicated to offering “WOW” service, and great franchisees who enjoy mentoring young people and helping them succeed. “WOW” service, coupled with our memorable brand and award-winning marketing, has helped us grow from one franchise unit in 2006 into a nationally known brand today. We are the fastest-growing franchise in the junk hauling and moving industries, but there still are many prime territories available nationwide. One of the things that makes College Hunks Hauling Junk unique is that we offer two services in one franchise — junk hauling as well as moving. College Hunks started out focused solely on the junk hauling industry, and Nick and Omar were able to build a million-dollar junk hauling operation in Washington, D.C., in just two years by offering great junk hauling service. College Hunks Hauling Junk now offers moving service as well. The two services have the same basic needs: trucks, muscle, great management and bold marketing. The two business models are distinct, but share a lot of overlapping needs, so by offering both services franchisees are able to generate more revenue while getting the most out of the resources they put into their businesses. Just as McDonald’s is able to ask their customers “Do you want fries with that?” when they order a hamburger, we are able to ask our customers “Do you want junk removal with that?” whenever they book a move. According to the American Moving & Storage Association, Americans spend about $9.7 billion a year on moving and packing and packaging services. And it’s an industry that is ripe for business owners who are committed to providing excellent customer service, for two reasons. No. 1, moving is one of the most stressful events in life, behind death of a spouse, divorce, serious illness, losing a job or getting married (hey, happy moments can be stressful, too!). When your life feels like it’s being turned upside down, it’s nice to have someone to help make the transition easier. That leads to reason No. 2: The moving industry doesn’t have a great reputation. Horror stories abound in the moving industry from customers who perceive movers as sketchy and careless, or worse, looking for ways to rip them off. College Hunks Hauling Junk eliminates those concerns by providing stress-free service that is focused on delivering a great customer experience, as well as a great move. We conduct background checks on all of our employees, who tend to be college-aged guys and girls who have a lot of potential. We tell our customers that the hardworking people moving their belongings are tomorrow’s leaders. And it’s true. One of our core values is “Building Leaders,” and our systems are designed to help your staff learn the skills they need to succeed, by growing into management positions within the company, becoming a College Hunks franchisee themselves or becoming a successful professional within their chosen field. Our brand also sets us apart. The name “College Hunks Hauling Junk” is a pattern interrupt that is instantly memorable and changes the way people think about junk hauling and moving, and we amplify the power of that name through world-class branding and marketing. We’ve won three awards from the American Marketing Association and three more from the Property Management Association, and the media loves us. We are what marketing guru Seth Godin refers to as a “purple cow,” because we are unique and stand out from the crowd of dull brown cows in our industry. The College Hunks name earns more than a few smiles and a a lot of media attention, and once customers understand what it’s all about, it earns a lot of respect. “HUNKS” is actually an acronym that stands for Honest Uniformed Nice Knowledgeable Service. Unlike other moving companies where guys might show up in grungy jeans, tennis shoes and a T-shirt, College Hunks employees arrive wearing bright green polos, orange caps, slacks and work boots. Every team member introduces himself to the homeowner and is friendly and approachable. They also know their stuff — training is a big part of the mission for our owners, who serve as coaches and mentors for the guys and girls on their team. Why is now a great time to start a College Hunks franchise? Moving and junk hauling are always in demand because people are always moving to buy a bigger home, to downsize in retirement or to start a new job. According to the American Moving & Storage Association, about 36 million Americans move each year. Real estate sales drive much of the opportunity for sales, and as home sales increase, so does the need for moving and junk hauling. Of course, a company with great systems and superior service can grow market share even during a weak economy, but with real estate on the upswing, now is an ideal time to establish yourself in this industry. College Hunks Hauling Junk also has prime territories available nationwide, and we award large territories to franchisees. We expect to quadruple in size before running out of prime territories — but that should take just a few years. Now is the time to check on the opportunity in your city and seize it if it’s still available. Our brand is getting bigger, and so are our franchisees’ average sales. From 2010 to 2013, our number of locations increased 143%. Average sales for our franchisees grew 42.6% from 2011 to 2013, reaching $442,504 in 2013. To start a College Hunks Hauling Junk franchise, you should have $75,000 in liquid capital and a net worth of $250,000 or more. Total startup costs, which include six months of working capital, range from $95,000 to $207,950. To learn more, complete the form below to explore our franchise opportunity. College Hunks Hauling Junk is not currently active in our directory, but here are some other recommended selections for you to explore.